Advanced Nutrients Iguana Juice is a 100% organic one part liquid fertilizer. Made up of a variety of guano, as well as premium ingredients such as earthworm castings, krill, volcanic ash and yucca extract. Iguana Extract has been quadruple clean processed to be deodorized and disinfected, and is one the cleanest smelling organic fertilizers available. Iguana Juice has been quadruple pressure filtered so it flows smoothly, and can be easily used in any hydroponic system, and it contains a gentler nitrogen so it will not burn plants. 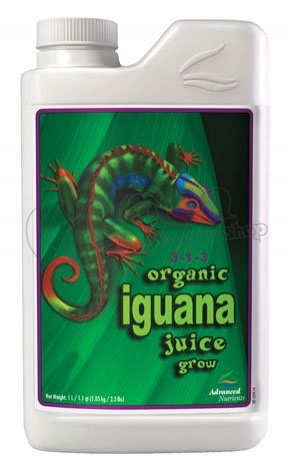 Iguana Juice will encourage high yields with excellent flavor, and is easy to mix and use.